IT’S FRIDAY, FRIDAY, GOTTA GET DOWN FRIDAY, &C.
Great event Monday in New York, including appearance by professional impersonator Joey Scarniecko. Next, Milwaukee. Westward the course of Camden Joy’s empire takes its way. 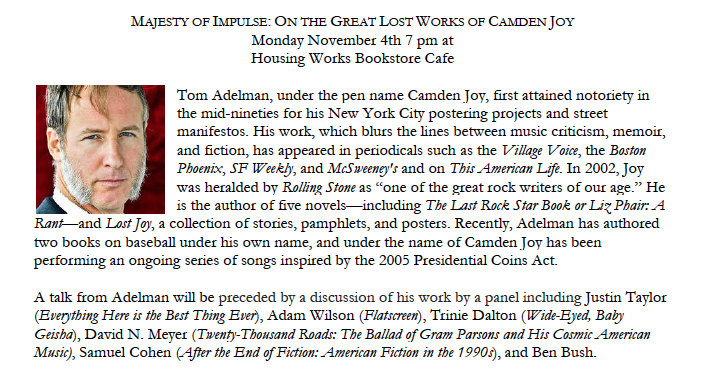 Author Samuel CohenPosted on November 6, 2013 November 6, 2013 Leave a comment on IT’S FRIDAY, FRIDAY, GOTTA GET DOWN FRIDAY, &C.
On Monday, November 4th, from 7-8:30, New York City’s Housing Works Bookstore Cafe* will be hosting “Majesty of Impulse,” an evening of Camden Joy appreciation featuring a panel discussion and then a talk by Tom Adelman, AKA Camden Joy. Samuel Cohen, Associate Professor of English, University of Missouri, author of After the End of History: American Fiction in the 1990s and co-editor of The Legacy of David Foster Wallace. Justin Taylor, author of Everything is the Best Thing Ever and The Gospel of Anarchy. *Housing Works Bookstore Cafe (located at 126 Crosby Street) has established itself as a New York downtown institution; 100% of its profits go to Housing Works, Inc., a healing community of people living with and affected by HIV/AIDS. 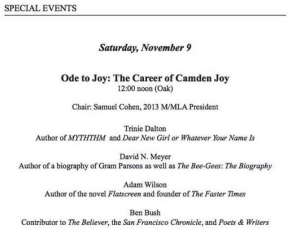 This year the President’s Keynote Speaker at the 55th Annual Convention of the Midwest Modern Language Association will be Camden Joy. 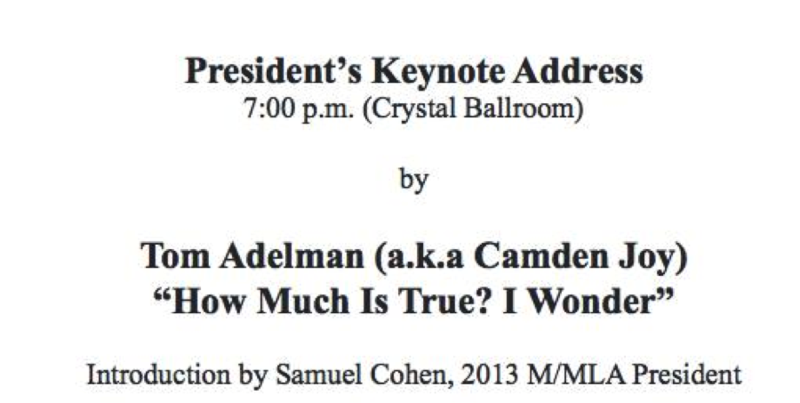 He will be delivering an address titled, “How Much is True? I Wonder.” The Keynote Address will take place the evening of Friday, November 8th, in the Hilton Milwaukee City Center. Details to follow. 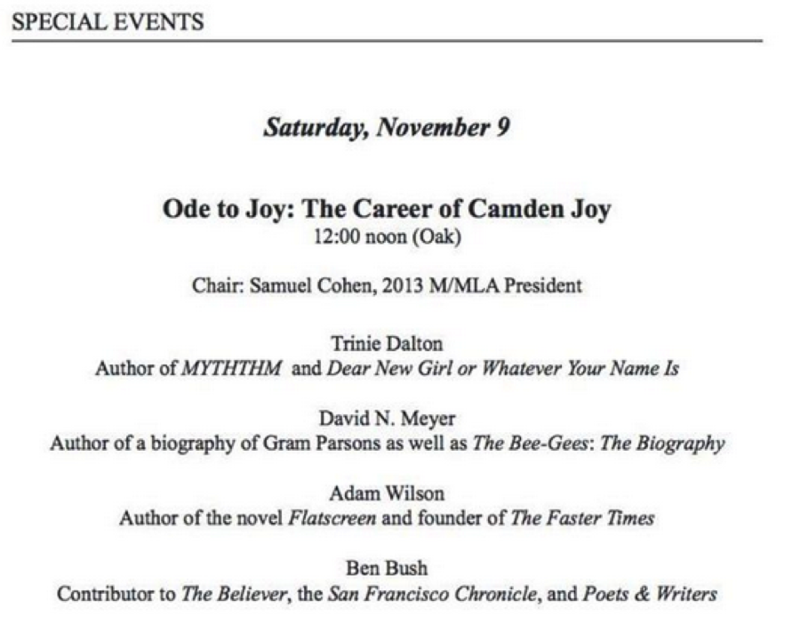 This site is dedicated to serving as a place to announce a few upcoming events focusing on the work of Tom Adelman, AKA Camden Joy. Adelman, under the pen name Camden Joy, first attained notoriety in the mid-nineties for his New York City postering projects and street manifestos. His work, which blurs the lines between music criticism, memoir, and fiction, has appeared in periodicals such as the Village Voice, the Boston Phoenix, SF Weekly, and McSweeney’s and on This American Life. In 2002, Joy was heralded by Rolling Stone as “one of the great rock writers of our age.” He is the author of five novels—including The Last Rock Star Book or Liz Phair: A Rant—and Lost Joy, a collection of stories, pamphlets, and posters. 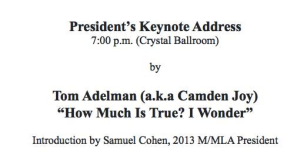 Recently, Adelman has authored two books on baseball under his own name, and under the name of Camden Joy has been performing a series of songs inspired by the 2005 Presidential Coins Act.